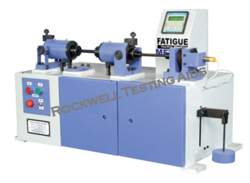 Leading Exporter of digital fatigue testing machine and dial thickness gauge from New Delhi. Our product range includes a wide range of Other Machine such as Bend & Re-Bend Testing Machine, Chain & Rope Testing Machine, Digital Fatigue Testing Machine, Digital Torsion Testing Machine, Electronic Extensometer, End Quench Test Apparatus and many more items. Thickness Gages offer a quick and efficient means of inspection with their convenient grip handle, thumb trigger and springloaded spindle. The various models cover a wide range of applications. These thickness gauges are especially handy for measuring thickness of small parts, metal, rubber, vinyl, paper, foil and other sheet material.